Are you in need of a good jest? Well then, Joker Poker is here to deliver! One of the most popular variations of video poker out there, Joker Poker will have you laughing and winning all night long. Sometimes referred to as Joker’s Wild, the rules of this video poker game are similar to standard poker so it’s easy to pick up, even if you’re a slow learner. And it doesn’t matter whether you’re a total newbie or a video poker pro, the rule variations will have you winning more than ever before and singing a victory song. Keep reading to learn everything there is to know about how to play Joker Poker! Before you can even begin to think about picking up your mouse and playing a round of Joker Poker, you’ve got to learn a thing or two about where it came from. The card game of poker has been around for a long time and established itself as one of the most popular casino games. With the first poker games being recorded in the 1820s, poker has created a whole casino game culture around a battle of the wits, takings risks, and finessing a whole room of people. Since then, the world of poker has come a long way. With the advent of random number generators or RNGs, casinos could replace your favorite games’ dealers with computer programs. The next natural step of casinos was to take poker to the internet. Thanks to RNGs, you can play all of the most popular video poker games on your computer from the comfort of your couch and in your favorite pair of jammies. As of now, there are eight main variations of video poker – but the only one we care about right now is Joker Poker! Joker Poker rules are easy to learn and the game is fun to play. Just like classic table poker, the goal of Joker Poker is to see what cards you’re dealt and get the highest ranked hand. One of the reasons you might fall in love with video poker is the prizes you win are outlined based on which hand you receive. Unlike standard poker, where you play against others and may lose everything if someone has a better hand, you will always win a little something for every winning hand. All you have to do is play it smart, pick and choose the best cards, and win big! 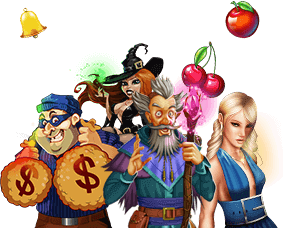 The first step is super simple: download the Slots of Vegas casino software to play the game. Once you’ve done that, you can start playing the game. If you want to learn the Joker Poker rules first, check out practice mode. This will let you play the game without placing real money bets, so you don’t have to worry about your bankroll while you’re watching your cards. Once you’ve got the video poker game up and running, you have to make a bet, either using your own bankroll or the practice mode’s fun money. Just like the good old land-based casinos’ video poker machines, you make bets in this game with coins. You first choose the denomination of a coin, pressing the up or down arrows on the left side of the screen until the amount suits your taste. Denominations can range anywhere from $0.05 to $5 per coin, so it’s perfect for anyone and any budget, even if you’re a miserly old man or rolling in dough! Once you’ve set the bet amount, it’s time to choose how many coins you’re going to bet. To play it safe, press “Bet One” to put down one coin. You can keep pressing the button to add one coin at a time. If you’re feeling especially lucky today, you can press the ‘Bet Max’ button, which will bet the maximum number of five coins. Now you’re ready for the dealing. Click the button labeled ‘Draw Deal’ to get your initial five cards. Click on the ones you want to keep, which freezes them, and click ‘Draw Deal’ again. This will replace your unwanted cards with new, and hopefully better, ones. If you get a winning hand, you receive instant payouts. If you don’t, keep trying until you can do a little victory dance of your own. Just like standard poker, the Joker Poker rules rank the cards in the same order, starting with 2 and going up through 10. Then the card order continues through Jack, Queen, King, and Ace. Joker Poker plays a 53-card deck, taking the original 52 cards and adding in the namesake card, the Joker. 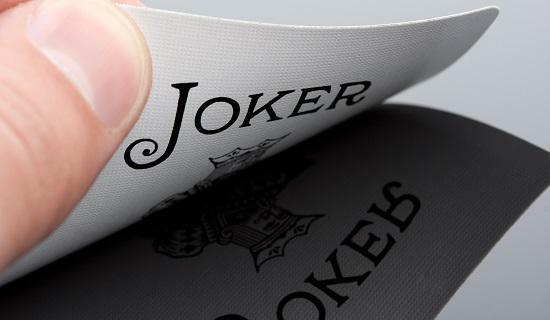 In Joker Poker, the Joker card is your best friend – it acts as a wild card. This means that if you’re one card short of a high-ranked, winning hand, all you need is a joker to replace it. This not only helps tip the odds even more in your favor, it’ll keep you on your toes. Pay attention to the cards you get and discard, because you never know when you’ll get surprised by a winning hand! Joker Poker is a game of thrills and strategy. It’s close to the standard poker you may have grown up playing in your living room or around a green card table with friends, with a few exceptions. In Joker Poker rules, a pair is a winning hand, but only with kings or better (an Ace card). This is not as advantageous to you because other pairs won’t count towards your win, but that’s okay because Joker Poker offers its players other ways to win big. Because the Joker card can stand in for anything you need, a new hand is introduced into the ranking: a Royal with Joker, which is a Royal Flush with one card substituted with the Joker. There’s also the new potential to get a hand with five of a kind! Listed below are the winning hands ranked from highest to lowest on Slots of Vegas’s Joker Poker game. The good news is that you don’t have to worry about being beaten by another opponent, so even with a low hand like Kings or better, you can watch the payouts pour in! Joker Poker strategy is different from any other video poker game because of the addition of the Joker into the deck. Below, we’ve listed the simple strategy that will help you improve your results when playing the majority of Joker Poker games on the market. The first chart illustrates the moves you should take when your hand doesn’t have a Joker, while the second chart shows you what to do if you do hold a Joker. The left-hand column in both charts lists the type of hand, the middle column tells you how many cards to hold, and the right-hand column tells you how many to discard. Be aware that some games – like the Joker Poker on Slots of Vegas – ranks the hands in a different order than other games. While the hands might be ranked slightly differently, this Joker Poker strategy still applies and will help you improve your gameplay. In poker, when a straight is open both ends it means that it can be completed on either the higher side or the lower side. For example, a straight of 4, 5, 6, and 7 may be completed with either a 3 or an 8. When a straight is classified as an inside draw, it needs a card in the middle to complete the straight. For example, a straight of 2, 3, 5, and 6 can only be completed with a 4. These charts illustrate the simplest Joker Poker strategy for players to follow in order to improve gameplay. Print these charts out and have them with you while you play Joker Poker online, or pull them up in a new window next to the Slots of Vegas desktop app to make it even easier. You can always start by playing Joker Poker for absolutely free before you ever lay down any real money. So, we’ve covered everything about Joker Poker rules, how to play, and the specific strategy you need in order to improve your returns. Now all that’s left is for you to log onto Slots of Vegas and start practicing! Pretty soon you could be a Joker Poker pro and give new meaning to “laughing all the way to the bank.” Log on and start playing now!